When a friendly creature dies, gain 1 health. 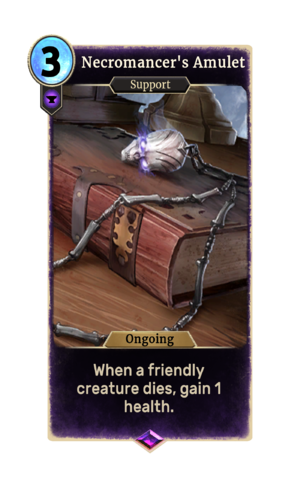 Necromancer's Amulet is an epic Endurance support card. It is part of the Core Set. "Kavushte Ka'a (IPA: [kʰa.vuʃ.tʰe kʰa.ʔa])"
The Necromancer's Amulet first appeared in Daggerfall, then later reappeared in Morrowind, Oblivion, and Skyrim. It is unclear what the card's summon audio is meant to represent. This page was last modified on 17 February 2019, at 14:39.